RONIN. Noun, historical. A samurai who no longer serves a daimyo, or feudal lord. From director John Frankenheimer (Reindeer Games, The Manchurian Candidate) comes Ronin, a pulse-pounding, action-packed crime thriller featuring an all-star cast headlined by Robert De Niro (Taxi Driver, Heat) and Jean Reno (Léon: The Professional). On a rain-swept night in Paris, an international crack team of professional thieves assembles, summoned by a shady crime syndicate fronted by the enigmatic Deirdre (Natascha McElhone, The Devil s Own). Their mission: to steal a heavily guarded briefcase from armed mobsters, its contents undisclosed. But what begins as a routine heist soon spirals into chaos, with the group beset by a series of double-crosses and constantly shifting allegiances, and it falls to world-weary former CIA strategist Sam (De Niro) and laconic Frenchman Vincent (Reno) to hold the mission together. A latter-day return to form for Frankenheimer, the film evokes the same gritty milieu as classic 70s crime fare like The French Connection, in addition to anticipating the early 21st century trend towards more grounded, realistic action movies, exemplified by the likes of the Bourne franchise. 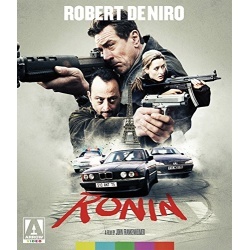 Arrow Video is proud to present Ronin in a brand new, cinematographer-approved 4K restoration, allowing this jewel in the crown of 90s thriller cinema to shine like never before.